On my first morning in the tropical locationI was awoken at 5am by the sound of what sounded like an ape in my bedroom. In actual fact, it was a group of howler monkeys in the tree outside my bedroom window. There were about six of them, apparently on the move, and making a lot of noise about it. Since I was awake already I decided to take a walk along the beach before breakfast, to take in my new home properly. I walked the southern end of the beach, which is the shorter one. I crossed a few rivers, passed the end of the village and made my way all the way to a rocky outcropping, impassable at high tide. As I walked I watched the keen early-morning surfers tackling the mountainous waves with ease, and explored the little rock pools and different shells littered on the shore. On my way back I cut up on to the village track, and found the horses and the surfboards that I could rent. Sorted. Arriving back for breakfast, there was excitement at the house. Last night on the second patrol a green turtle had been sighted, although she had not laid eggs as there were too many roots in the sand. The green turtle is listed as in danger of extinction, and its appearance here is a very good sign. Apparently, the green turtle will, unlike the olive ridley, return to the same beach every night until it has laid its eggs. Everyone is desperate to see the green turtle, which is much bigger than the olive ridley at about 100cm in width in comparison to 70cm, and so some people are doing both patrol shifts tonight in the hopes to see her. After breakfast we walked the northern side of the beach, which is much rockier and wilder. It was raining slightly, but the sun came out for a bit, casting a whole new light on the beach. In the afternoon, whilst doing exhumations in the hatchery, the local children all came running over to watch us. We found some baby turtles in the nests, and their faces were an absolute picture. It was like magic. Releasing them into the sea proved to be difficult though, as they were all pushing and shoving to see them, to touch them, to lift them up and put them in the sea. Obviously they were trying to be helpful, but as we didn’t want to stress out the newborns already, we took the children aside and started a sand turtle building competition. Soon the sand was littered with sand turtles of all shapes and sizes, with up to 15 children taking part at one time. They were so pleased with their efforts, and one of them even came up to me, took my hand, and walked me over to her turtle to admire it. Once those had finished, we clubbed together to make a giant sand turtle, explaining about turtles as we went. We showed them how to protect the nests, and how important it was to keep the beach clean so that the turtles can get up on to the sand to lay their eggs. It was so much fun and we all got absolutely filthy. In the evening we watched the locals playing football at the pitch, the central part of the village, before heading off on the patrol. What a shock I got! I had become used to poachers, but they were not a patch on what was going on here! True, at previous beaches it was organised poaching by one or two families who would poach every night given the opportunity. Here there were groups of friends out for the evening to test their luck on the beach- some of the members of the groups were very young, maybe seven or eight. We saw approximately thirty poachers in the space of three hours, which seemed obscene. Luckily there were no turtles, so no eggs were poached (twisted logic, I know!) On our way back to the house at the end of the shift we were suddenly startled by two men who seemed to materialise from nowhere. They wore heavy black boots and were carrying the largest guns I have ever seen in reality (as opposed to on television). For a moment I was terrified, and processed no information other than that they had huge guns, they were huge and muscled and it was dark. After a few moments of mental blank however I realised that they were chatting away with the other people I was with, and were in fact the police, or the coastal guard. They told us that they would be patrolling the beach at night too, to ward off poachers. We pointed them dutifully in the direction from which we had just come, mentioning the poacher party going on up the beach, fully aware that they could do nothing unless they were caught with eggs in their hands. Their very presence however was reassuring, and a very positive step in the right direction, as through all of the corruption here, it shows that some vestige of what is meant to happen actually is. 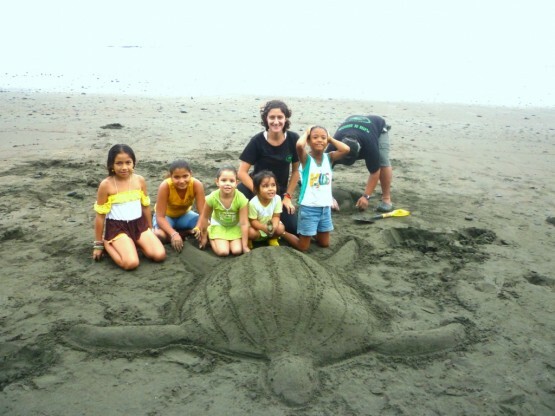 Find out more about turtle conservation in Costa Rica.